I am preparing to create the secondary level public school priority enrolment area map for Canberra ACT. There are two different type of secondary public school in Canberra ACT, high schools and colleges. After a brief research, the High Schools cover from year 7 to 10 and college going from year 11 to 12. This is differs significantly from most other states. With other states and territories, in majority of the situation, the secondary level schools goes from year 7 to 12. This obviously complicates the map creation, as I will have to create two sets of map for the secondary level. Canberra ACT also got a lot of over lapping priority enrolment area at primary level, the second level is no exception from what I Can see, This should be a fun one as I am doing as a side project right now while concentrating on a different state. 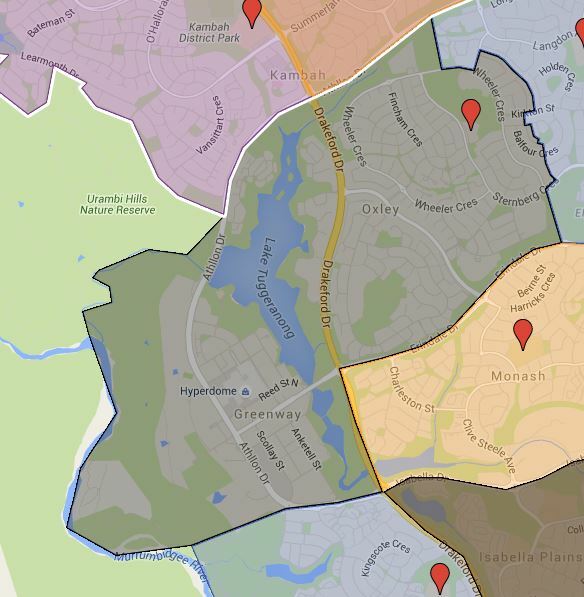 This is the Priority Enrolment Area or Catchment Map for Yarralumla Primary School in Canberra, ACT. You can search for a particular school or address in the search box in the top right-hand corner of the embedded map or zoom into an area of interest on the map. This is the Priority Enrolment Area or Catchment Map for Latham Primary School in Canberra, ACT. You can search for a particular school or address in the search box in the top right-hand corner of the embedded map or zoom into an area of interest on the map. This is the Priority Enrolment Area or Catchment Map for Wanniassa Hill Primary School in Canberra, ACT. You can search for a particular school or address in the search box in the top right-hand corner of the embedded map or zoom into an area of interest on the map. This is the Priority Enrolment Area or Catchment Map for Wanniassa Primary School in Canberra, ACT. This is the Priority Enrolment Area or Catchment Map for Turner Primary School in Canberra, ACT. You can search for a particular school or address in the search box in the top right-hand corner of the embedded map or zoom into an area of interest on the map. This is the Priority Enrolment Area or Catchment Map for Torrens Primary School in Canberra, ACT. You can search for a particular school or address in the search box in the top right-hand corner of the embedded map or zoom into an area of interest on the map. This is the Priority Enrolment Area or Catchment Map for Theodore Primary School in Canberra, ACT. You can search for a particular school or address in the search box in the top right-hand corner of the embedded map or zoom into an area of interest on the map.